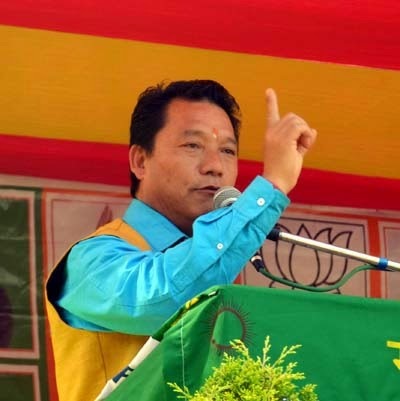 Gorkha Janmukti Morcha president and GTA chief Bimal Gurung today criticised the state saying it was continuing non-co-operation in matters related to the hill body making it difficult for them to run it. He added that talks on transferred subjects have been "fruitless" and disappointing. "The state is not co-operating in matters related to GTA. Because of such non-co-operation, we are finding it tough to run the autonomous body. Many state departments are yet to be transferred and on several occasions, the state is overruling the GTA. Also, no assessment or discussion is being held on the tripartite agreement we have signed along with the state and the Centre for the formation of the autonomous body," Gurung, who visited closed Dooars estates today, said. "Despite several rounds of talks with state representatives, the problems have not been resolved. Such fruitless meetings have left us disappointed. Let the GTA run in the manner in which it is running these days. Our principal demand is statehood and we are working on it. The GTA is just a stepping stone. If such non-co-operation continues, we will have to ponder over whether we will run the GTA," Gurung added. Yesterday, he reached Chamurchi near Banarhat in Jalpaiguri district to attend a party workers' meet. Today, he visited the shut Redbank, Surendranagar, Dharanipur and Bandapani tea estates. "The state has miserably failed to address the problems of thousands of jobless workers and their dependents in the closed estates. The state has acquired some of these gardens but could not reopen them to end the plight of the people," Gurung said. "People are dying of malnutrition and starvation in these estates," he said. In November last year, the state acquired Redbank, Dharanipur and Bandapani estates and cancelled the land lease of these three gardens. "Along with the state, all political parties who have trade union fronts in these estates are also responsible. They are doing politics with the hapless workers and they are least concerned about how they and their families can be saved. We are not for politics and we will soon write to the Centre requesting intervention and necessary steps to reopen these gardens," Gurung said.